Thanks a lot sir for help everyone who needs a divine symbol of MIDAS . 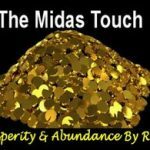 I feel very lucky to attune MIDAS . you are able to change the life of every one who attuned MIDAS.thaks a lot.